All of our earnings-related options ideas from yesterday’s report saw increases during the session, so we want to kick things off today by going over those performances, as well as formulating another fresh idea. Dollar Tree, Inc. DLTR – We also highlighted the DLTR 04/21 $78-80 Calls, and while they did see marginal increases, it was nothing to write home about just yet. That’s why we just wanted to remind our readers that these are longer-term idea which could take some time to show us the sort of upward moves we’re looking for. Snap, Inc. SNAP – Our bearish signal on SNAP Friday led to success in the SNAP Weekly $20 Puts that we were watching. They gained 246% intraday running from .30-1.04. 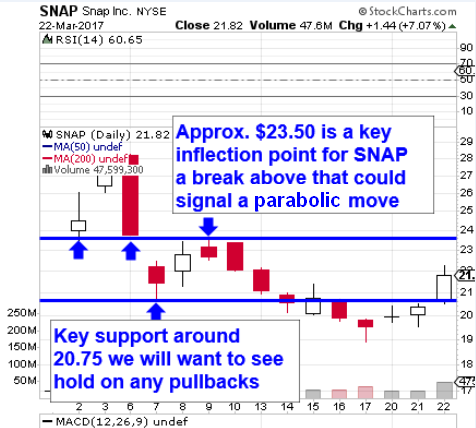 Today, we want to reverse our strategy and go with some calls, the SNAP Weekly $22-23.50 Calls to be exact. We had MBRX in our extended watchlist yesterday, and were pleased with its solid performance on the day. The stock ran from 1.15 to a high of 1.51, which works out to a respectable intraday increase of 31% The move came on immense volume of more than 40X the 30-day average, so we’ll definitely be interested in continuing to track MBRX as we head into the end of the week.